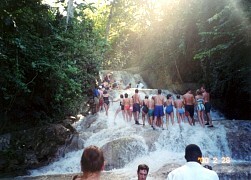 Dunns River Falls is the popular tourist attraction on the North coast of Jamaica. 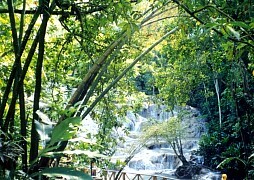 We booked a bus trip to the Falls from the travel desk at our resort. 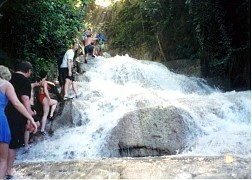 This page and the next give you an idea of what it like to walk down to ocean level and climb back up Dunns River Falls. 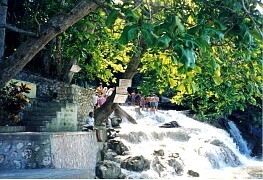 It is among the prettiest scenery in Jamaica. We rented rubber walking slippers and began the downward descent to ocean level. 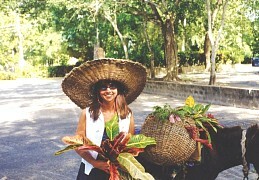 Some natives grabbed Margaret and had her pose with the plant and donkey. They didn't ask for money up front. We really weren't thinking about it but should have. When they asked for money for having her pose, we didn't have anything small to give them. Faced with this situation in the future, we will know to ask up front and negotiate a price. As it was, we stiffed them. 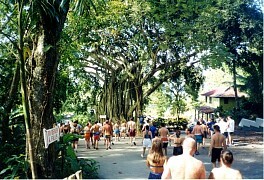 This tree, used as an organizing point for tour groups, is huge. We waited under it until enough people gathered to make up a group. 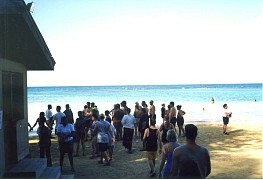 If you enlarge the picture you can see a guide in a blue shirt giving instructions to his tour group. This is a shot of the river as we walked down the path to ocean level to start our climb. We were diverted to a locker area where we could store the things we didn't want to get wet. I think you were supposed to bring your own lock. Here we are at ocean level. After taking the pictures for this trip I really want to get a better camera. The one I used had trouble with light levels. This is a poor picture, but I enclude it so you can better imagine the scene. Here is the starting point. Our guide had everyone hold hands and form a chain to climb up. After a while people stopped doing that and just assisted each other as needed. The water rushing by is quite enjoyable. In lots of places steps are worn into the rocks so the footing for the most part is pretty good. The climb up is slow and not tiring at all. You weave from side to side up the river to find the best course. We had to duck under this bridge to continue our climb.